Embedded Ethernet modules like the XPort and Wiznet Shields cost about $40 and tether your project to a thick cable. Now each of these methods has an upside too. Ethernet is fast and reliable, WiFi easily found, cell modules can connect from anywhere and Bluetooth has a zippy data rate and a smart-looking logo. But I’ve always thought it would be great if you could just attach a microcontroller to a cheap radio and hit the Internet wirelessly with a simple URL. No thick cable, no tricky setup, no IP address management, no encryption configuration, no data plan and no pairing. 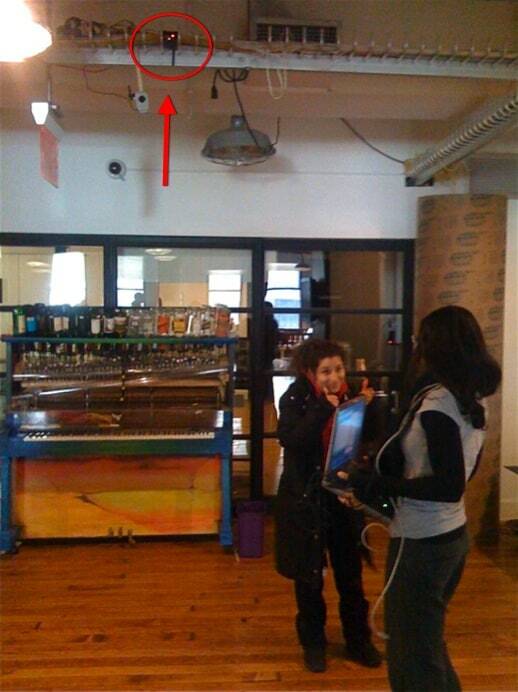 The ZigBee* Internet Gateway I’m developing at ITP aims to accomplish just that. Students link their radio to the Gateway, then simply print a URL to the serial port and wait for the results to come back from the Internet. Each radio costs as little as $19. Using Digi’s ConnectPort X2 as a base, I’m developing code in Python that processes these requests in a way that’s simple and open to everyone. This afternoon I installed a beta test unit for my Networked Objects class to try out. Right now it supports HTTP and HTTPS requests, with plans to expand to email, FTP and XBee I/O direct formats if there’s a demand for that. I’ve started a basic documentation page for the ITP community and will publish the Gateway code when it comes out of beta. ITPers who are interested in testing should contact me. * the beta is running 802.15.4 since more students have those modules. Full ZigBee will be included after testing. I’m a student working on developing Zigbee to IP bridge and viceversa..I’m trying to implement it on linux system.What I understand is that I need to have both the IP and Zigbee stacks on the system.TCP/IP stack is present in linux system but Zigbee stack isn’t there.So how can I go about it? Zigbee stacks are provided by TI,Microchip and so on..But can I use them to develop bridge in the system? (what I assumed is that those stacks can’t be used as they are microcontroller specificI have a CC2430dk kit..How can I proceed with my project? Looking forward for your suggetions..
You could take a look at ZigBuzz. I’ve got a brand-new Connectport x4 here at home that I am starting to experiment with and would love to have this type of generic ‘Internet Gateway’ ability for the personal networked-objects learning/research/experiments I am working on. Yes, it should run fine on an X4 and yes we are working to get it robust and open source. There’s a project going at ITP right now that will have code ready to share possibly sometime over the summer or in the fall. I see its not exactly brand new (the first commit was in July, most recent in October). But, having not seen it until today, its new to me, so I’m excited! Are more updates in the works? Yup, still in development. Expect to see some more in the next month or so. Ok, we’ve waited over a month with baited breath. Any updates? 1 Pings/Trackbacks for "ZigBee Internet Gateway: ITP Beta Test"